As you may remember from my recent goals for this year, I have a goal to read 19 books in 2019. Today I thought it would be fun to look ahead and introduce some of the books I hope to read as well as enlist your help for what I should read this year. I have always wanted to read this book ever since VeggieTales did a spoof of it called the Asparagus of LaMancha. I did a little research into the background of this book to get a better idea of the context in which it was written before I started reading. Don Quixote was written by Cervantes in 1605 in Spain. This means the book was written during the Golden Age of Spain where literature and art were flourishing. While Cervantes’ book was a commercial success and is considered to be one of the first ‘popularized’ novels, Cervantes was writing against the romanticized view of chivalry. The translation I am reading was done by John Rutherford, and in his preface he emphasizes how scholars, often led by the understanding that Don Quixote was popular, assume that Cervantes has a serious and literary approach to his work. Rutherford argues the opposite. Cervantes work is, at its heart, “a funny book.” I’m about a hundred pages into the 900 page tome, and I can’t help but agree. This 400 year old book is cheeky, absurd, and completely aware of itself thus leading to merry amusement as Don Quixote and his trusted Squire, Sancho, go on increasingly ridiculous adventures all in the name of chivalry. I didn’t st art this book with the hope of reading it in one sitting, but that’s mostly what happened. Technically, I read the book in two sittings, but all the reading took place on the same day. So, depending on how the year goes, I may revisit this book goal. Daughter of the Pirate King is a book I found in the Middle Grade section of the bookstore, but after reading it, I’ve discovered that it is decidedly YA. The tale is fun and lighthearted for the most part, but Levenseller doesn’t shy away from some of the nastier aspects of pirates, and she weaves a story that is constantly walking the line between adventure and romance with a female lead who knows exactly what she wants and how to get it even as she deals with complex setbacks from both the pirates holding her captive, but also as she reaches into her calloused heart and fights with the person she’s become from a hard life as a pirate. Levenseller mentioned that one of the reasons she wrote the book is because of the lack of pirate books on the shelves in bookstores and libraries. 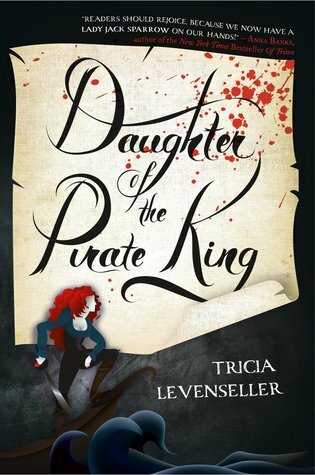 I agree with her, and think Daughter of the Pirate King is an excellent addition, perhaps even trailblazer in the genre. I have a whole section dedicated to books I’ve been meaning to read, but after a quick scan, the book I think I will read is The Vagrant. I started this book in 2018 and when life got busy, I never continued reading it. From what I already read, I’m excited for the carefully established world that Newman’s created that never feels empty or like a carbon copy of a medieval England world as so many fantasy books tend to be. The world the protagonist encounters on his journey always feels lived in, as if its constantly being affected by the actions of the characters in the story. A few of the key selling points about this book are the fact that the main character never speaks, the reader gets a sense that the protagonist is much stronger than he appears, and the tension of the story is driven by the fact that the protagonist carries a baby for most of the book meaning each fight and trial he encounters becomes tense as the life of this baby is inexplicably linked to the success of our hero. I love action movies and thrillers. I love them so much I’ve written at least two novels that fit within the genre, but I’ve never actually read any action/thriller novels. James Patterson is a giant in the genre, and it would be irresponsible not to read something by him. I’ve selected the first book in his Alex Cross series to read. I don’t know much about this book except that its set in 1889, France and features a treasure hunter as the protagonist. Honestly, that’s enough for me to be completely intrigued. The book was released January 15th(that’s today!). A review by @WednesdayBooks says that The Gilded Wolves has “the cleverness and action of a heist movie with a touch of fantasy and whole lot of charm.” Yes. Yes. Yes. This book is being released this year as well and is available on May 14th. From the author, We Hunt the Flame is an “Arabia-inspired fantasy narrated by a huntress masquerading as a boy and the assassin prince sent to kill her.” One of my most favourite tropes is girl masquerading as a boy, and adding princely assassins into the mix, as well as a fantasy world that’s Arabia-inspired instead of European-inspired makes this book something to be anticipated! I’ll stop there for today. In a couple days I will release the second half of the list. In the meantime, what books are you excited to read this year?